I co-wrote the award-winning ‘Clean Breaks – 500 new ways to see the world’ with Richard Hammond (founder of greentraveller). Rough Guides published it in August 2009, and then relaunched it in 2010 under the name ‘Great Escapes’. It’s sold around 30,000 copies to date. It’s the most comprehensive worldwide guide to unusual holidays and alternatives ways to travel that make a real difference to the lives of local people and the planet. For a preview of the book see: Clean Breaks Sample. The selection and presentation are inspired: this is a beguilingly simple, tactile compendium brimming with solid research and good writing. Dan Linstead, Editor of Wanderlust Magazine. The Mail on Sunday’s Book of the Week: When planning a holiday, what you’re looking for are good ideas – and this book is chock-a-block with them… Before planning your next break, this book, by Richard Hammond and Jeremy Smith, is well worth perusing. Frank Barret, Travel Editor, The Mail on Sunday. What I really like are travel books that make you desperate to visit the places they describe – Clean Breaks does this, and, best, it does it for every continent. The New Yorker. 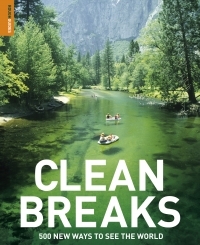 This book contains an impressive selection of some of the “cleanest” breaks available to the independent traveller. It is organised around geographical locations, with shorter sections on minimising the environmental impact of your trip. There are some inspired travel ideas, such as visiting a homestay scheme in a Ukrainian village, eco-tours in Iran or hiking through Saxon villages in Romania. Clover Stroud, The Sunday Telegraph. Fab book, brilliantly researched, and makes me very green… with envy, that I didn’t write it, of course. Catherine Mack, ethical travel columnist, Irish Times. All 400 pages are ridiculously tempting with the authors not only advising on some of the world’s rarest and most spectacular experiences – but how to do them in a way that minimises the effect on the environment. The book is divided into continents with pictures, descriptions and details of how to organise your perfect trip…although I should warn you the moment you start reading you will want to organise your perfect trip! Perhaps it should come with a health warning to be read only when you’ve just been paid… or when you’ve got lots of annual leave to use. In keeping with its title, it makes a clean break from so many things, including some guidebook conventions. After a mere page and a half of introduction, it plunges into a dazzling world of fresh experiences and hurtles through 122 countries in nearly 400 full-colour picture-filled pages of pure temptation… It is a special piece of travel publishing, one far more ambitious than anything I’ve seen from its competitors Ethan Gelber, WHL.travel. This book is packed with off-the-beaten-track adventures that minimize environmental impact. Flipping to any page to find a prospect like “Walk with rhinos at Leshiba” or “Pick a Papaya in Sri Lanka” makes for lush material for either planning or daydreaming. US-based Sierra Club’sThe Green Life. Printed on nearly 400 pages of FSC mixed source paper in full color, this is one of those travel books you’re guaranteed to reach for on a rainy day. With 500 hidden gem travel ideas, it’ll keep you’re itinerary full for quite some time too. The Alternative Consumer. Clean Breaks doesn’t preach about the planet but simply suggests fantastic places to visit which happen to be green. Sally Forth, customer book review on Amazon. I bought this as a present for someone, and started to read it before posting it – and ended up buying myself a copy as well…. It is full of useful details about every corner of the world, and a great read whether you are planning a specific trip or happily daydreaming about possible travels. Would make a great Christmas present for someone… Mark Green, customer book review on Amazon. Can’t put it down – have already planned so many trips! How amazingly huge and exciting our world really is. P. J. Waugh, customer book review on Amazon. While Clean Breaks’ emphasis on ‘ecotourism’ did seem a bit suspect to me at first – just another marketing ploy, perhaps (I’ve attacked the rhetoric of ‘going green’ in the past) – the authors’ intentions and tone seem wholly sincere. They acknowledge, for example, that “terms such as ‘responsible’, ‘sustainable’, and ‘ethical are becoming…overused (and abused) by websites and tourism companies looking to ride the green wave,” and “their repeated emphasis on localism and action over passive ‘sight-seeing’ is admirable. And even though most people will never have the money and time to complete the 500 trip wish-list that Hammond and Smith present here, the book still makes for a great fantasy. Good stuff. Editor of biblioklept. This is a guide book which encourages you to actively enjoy other peoples’ places, their environments and cultures. It is a great place to look for new ideas and to think about how you travel – how to get more out of your break, perhaps to clean and refresh the mind as well as the body Harold Goodwin, Professor of Responsible Tourism Management at Leeds Metropolitan University. For a clip of the launch, see: Launch Video Clip (on greentravelguides.tv).